Remain in Light in Cromer, Norfolk sleeps 2 people. 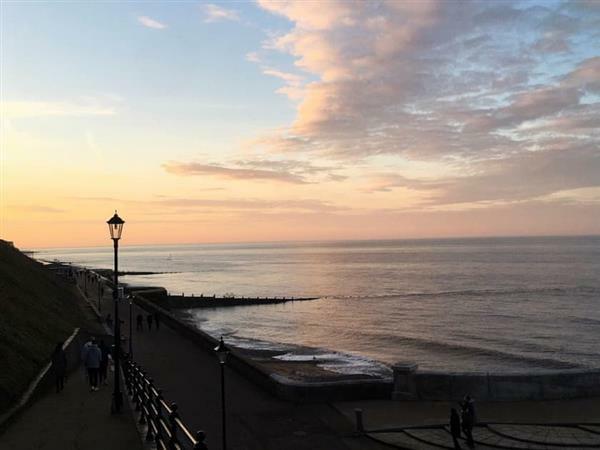 Remain in Light in Cromer is set in a quiet development a few yards from the bustling market town centre of Cromer with its wide sandy beach; Remain in Light is a great place to lay your head while exploring all that the area has to offer. Boasting a private parking space, a rarity in town centre properties, you could literally park up for the week and find a different place to eat and drink every evening on foot. For those who would like to take a rest from driving, the town is well served by a bus and its own mainline rail station. The bus route will see you pass through lots of pretty coastal towns and villages, all with different beach habitats. Or, enjoy Cromer and its famous Edwardian seafront, lovely pier and seasonal end of pier show. Cromer also offers the Amazona Zoo, a cinema and a great mix of artisan and traditional seaside amusements and shops. Travel by train to Sheringham, and then for a change of pace, embark on a trip on the historic North Norfolk Railway. Or, take the train to Wroxham, the gateway to the beautiful Norfolk Broads. Stay on board a little longer and you will be a 10 minute walk away from Norwich city centre, with its famous Norman Castle. History buffs will be spoilt for choice with numerous National Trust properties, stately homes, museums and the Muckleburgh and Thursford collections, which are all within easy reach. Bird watchers can travel in almost any direction to be in great wildlife habitats. So, all in all, this first floor apartment is in a great location for the perfect North Norfolk break. You will find the beach, shop, pub and restaurant all 300 yards from Remain in Light in Cromer. Gas central heating, electricity, bed linen, towels and Wi-Fi included. Welcome pack. Private parking for 1 car. No smoking. Holidays at Remain in Light run from Friday to Friday. For a better idea of where Remain in Light is, you can see Remain in Light on the map below. Remain in Light is in Norfolk; should you be on the lookout for a special offer, you can find all the special offers in Norfolk. It's always worth checking to see what is on offer at the moment. Do you want to holiday near Remain in Light (UK11164), you can see other cottages within 25 miles of Remain in Light; have a look to find your perfect holiday location.